Hikers is a Free Responsive Travel Blog Website Template. It encompasses features like classic slider, drop-down menu, newsletter form UI, footer widget are some. 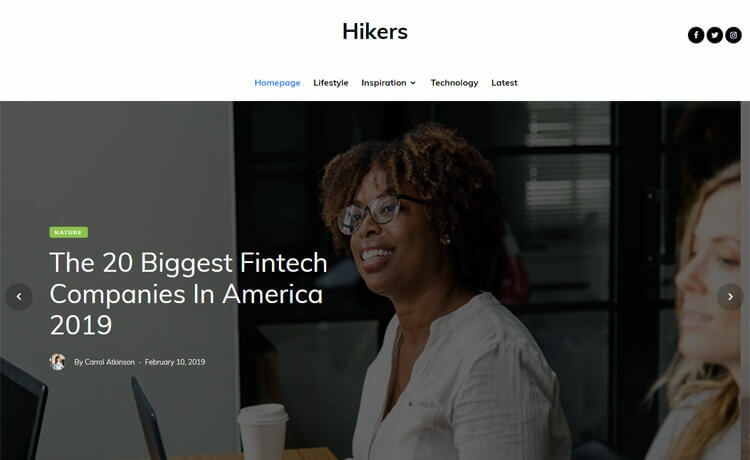 Hikers is a free responsive travel blog website template made with HTML5 and Bootstrap 4 framework. It is a multi-page theme with a clean and simple design. Moreover, a classic slider on the header makes it look more beautiful and attractive. Hikers come with some modern and effective features and assets. It encompasses features like classic slider, drop-down menu, newsletter form UI, footer widget, etc. Inside the package, there is a well-structured code to guide you throughout your development process. Create with Hikers and make an awesome travel blog site. Thank you for downloading Hikers.